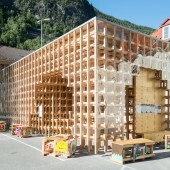 The Rjukan Town Cabin is built by 22 architect students from NTNU, and managed by the student group Rallar Arkitekter. 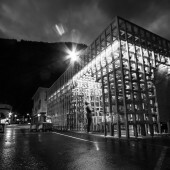 The project is a pavilion meant to be a new and different place to meet for the population of Rjukan. The pavilion is open for everyone at every hour of the day, and contains an exhibition with pictures from Rjukan in the past and present. The pavilion was built in only two weeks, but the preparations lasted for ten months. In september 2012 the six architect students from Rallar Arkitekter met the planning department in Tinn kommune at Rjukan to discuss a possible project. Tinn kommune was willing to finance the project, while the design and construction work was performed by the students. The task was open, leaving the students to decide what they wanted to build. 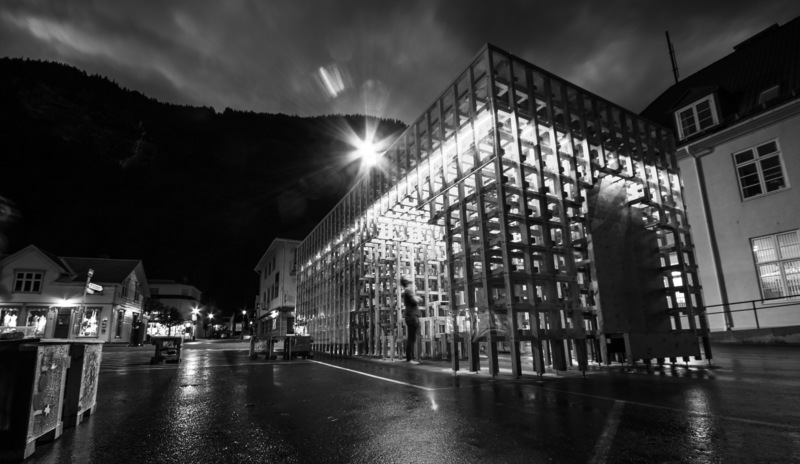 Their vision was to give the people in Rjukan and Tinn a place to meet that represented something new and challenging as a contrast to the historical city. The unique building consists of 4000 meters with 73 mm x 73 mm pine material, which is screwed together in a three dimensional grid. The facades is covered with clear plexi-glas. This gives protection from the wind and the feeling that one is inside. The clear plexi-glas does not prevent the transparency of the building, and maintain the contact from the outside. The wood construction form an open room facing the square, and a more closed room where the exhibition is placed. In addition it appears situations for sitting and meeting about in the pavilion. The whole pavilion is illuminated with LED-lights forming stripes in the upper part of the construction. The lighting can change colours and make different ambiances in the building. In this way the building can mark special occasions as the ice climb festival, and the celebration of the sun. In addition is the exhibition room lit with LED-spots. These elements will together make the new signal building in Rjukan to a lantern in the city. Now it is up to the people in Rjukan and Tinn to decide how they want to use the pavilion further. 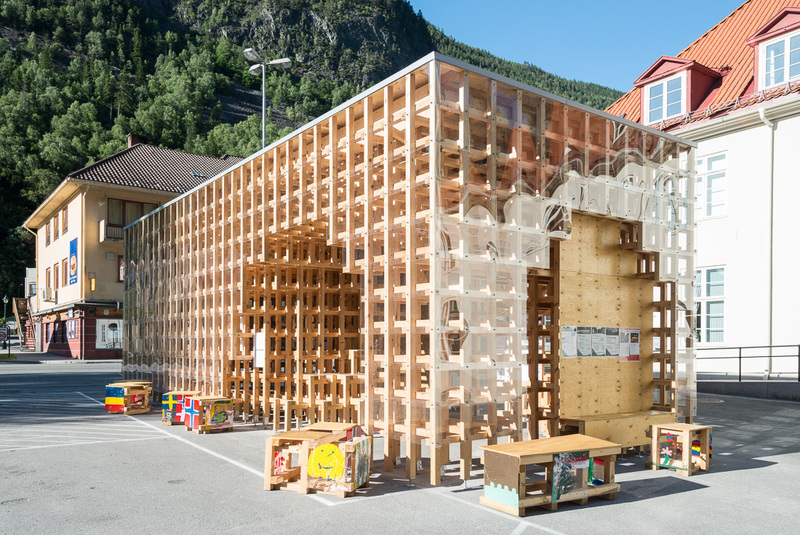 How can a simple shelter in wood generate more identity and urbanity in a minor Norwegian city?